Diabetes mellitus and in particular the life, adaptation, death and replacement of pancreatic islets are the main themes of my research. These clinical and research topics stirred my interest early in my career. In 1991 I received my medical doctorate at the University of Utrecht, the Netherlands. Subsequently, I moved to England and started research into islet biology and pathology at the Diabetes Research Laboratories in Oxford under supervison of Anne Clark and Robert Turner which resulted in a PhD thesis in 1994. In the same year I started my residency in Internal Medicine followed by a fellowship in Endocrinology at the University Medical Center Utrecht (UMCU). I was board certified in endocrinology in 2001. Early 2004 I made a move to the Leiden University Medical Center (LUMC) to focus on academic diabetology. Later in 2004 I joined the research groups of Susan Bonner-Weir and Gordon Weir at the Department of Islet Transplantation and Cell Biology (Joslin Diabetes Center) in Boston. In their groups I participated in the clinical human islet isolation and transplantation program and in islet progenitor cell research. 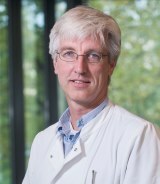 In 2006 I returned to the LUMC to establish a laboratory for human islet isolation and to direct the clinical islet transplantation program in the Netherlands. This was also the start of the Islet group at the LUMC. I was appointed professor of diabetology at the University of Leiden in 2011. Research into the life, death, adaptation and replacement of pancreatic islets is fascinating. The islets play a key role in diabetes mellitus. And the impact of diabetes mellitus, in particular type 1 diabetes, on quality of life in patients is enormous. Rather than symptomatic treatment consisting of insulin therapy, we need to aim for real solutions for patients. Functioning insulin-producing cells in patients are the ultimate solution. Using a bench-to-bedside approach I have been coordinating multicenter research programs on improvement of islet transplantation (DCTI) and developing new cell replacement therapies (RegMed XB) besides numerous national and international, basic and clinical research projects.